No, it wasn’t just a one-off event. When Swedish industrial band MISERY LOVES CO. returned in 2016 and hit the main stages at some of Europe’s leading metal festivals some might have thought of it as a temporary return. But a year later a new song, the instant MISERY classic “Would You?”, was released. 17 years after its critically acclaimed third album “Your Vision Was Never Mine To Share”, the band proved itself better than ever before. More shows followed, both in the U.S. and in Europe. 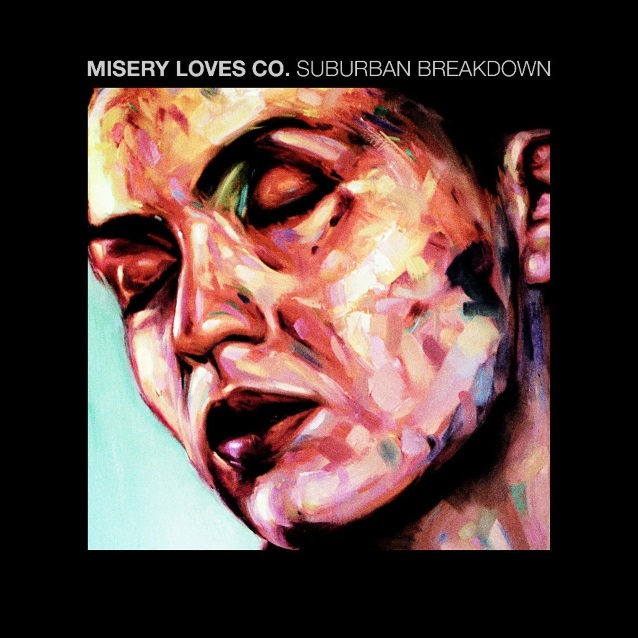 And now… “Suburban Breakdown” could be MISERY LOVES CO.‘s strongest song to date. Just like in the past, the band manages to mix aggressiveness with melody and innovativeness with an impressive songwriting. The chorus might be the best thing you’ll hear all year. “Suburban Breakdown” was mixed by Roberto Laghi (IN FLAMES, ENTOMBED A.D.) in Gothenburg. On the cover is an amazing piece of art by Italian painter Alessio Radice. Listen to “Suburban Breakdown” on Spotify. You can get the track digitally via iTunes. Tours and shows in both Europe and the U.S. followed with such acts as SLAYER, MACHINE HEAD, DEFTONES and PARADISE LOST. MISERY LOVES CO.‘s second release, “Not Like Them”, earned the band a Grammis (Swedish Grammy equivalent) in the “Best Hard Rock/Metal” category in 1998. This time Patrik‘s lyrics were even more personal, which is why he, to this day, gets response from people telling him how songs like “Prove Me Wrong” helped them get through bad times. The year 2000 saw the band release its last album, “Your Vision Was Never Mine To Share”, which was a huge step for the band musically. The dynamics of songs like the title track and “On Top of The World” were more impressive than ever and the band progressed in a very exciting artistic direction. Still, just a few months later, the band split up and the world became an inferior place. Until 2016, when MISERY LOVES CO. returned to the live stage at Gefle Metal Festival (Sweden), Bloodstock (U.K.) and Brutal Assault (Czech Republic) and has since then done club shows in Stockholm, Gothenburg and Uppsala. In 2017 they also boarded the world’s biggest metal cruise, 70000 Tons Of Metal.